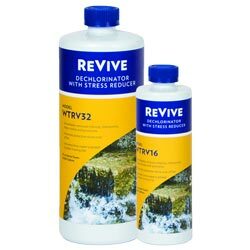 ReVive quickly removes the fish-toxic chlorine, chloramines and heavy metals often present in tap water. ReVive is especially beneficial to Goldfish and Koi in times of stress because it thickens the slime coat that helps fish recover from cuts and abrasions. Application Rate: For new ponds apply 1 oz per 200 gallons. Apply at the prescribed rate whenever new water is added. For Best Results: Apply ReVive to the area of greatest circulation to ensure the product will be dispersed throughout the entire pond.